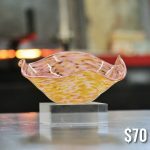 Group events at Sonoran Glass School are an exciting way to spend time with family, friends, employees, or members of your club or organization. 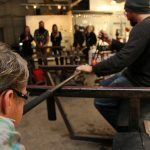 Groups of 5-20 people can pick from a variety of experiences, all of which allow them to make glass art pieces or see exciting demonstrations in one or more of our studios (parties up to 40 can also be accommodated but with a limit on activities). 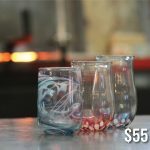 The price of your experience varies on how many people are in your group and which Make Your Own Glass Art Experiences you’ve scheduled. See group event examples below and call Associate Director Nick Letson at (520) 884-7814, and he’ll be happy to answer any and all questions and personalize a Group Event for your party. A group tour is comfortable for a group of 5-20 people, but more can be accommodated. 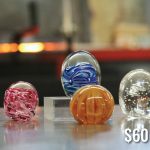 This tour takes you through the gallery, the Flame Shop, the Warm Shop, and the Hot Shop (studios that focus on torchworking, kiln-firing, and glassblowing, respectively), and the Sculpture Garden. 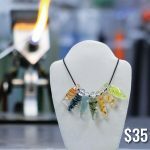 Your group will be shown the tools utilized in each studio and examples of the kind of glass art pieces produced in these shops. A group tour typically takes 30-60 min. Free-$5 Suggested Donation per person. 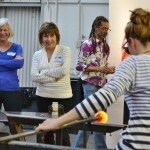 The Tour & Demo Option features all of the above with an exciting glassblowing demonstration at the end. We will set up chairs, a PA system, and wireless microphone for our instructor to walk you through the process and explain the techniques he/she is utilizing along the way. 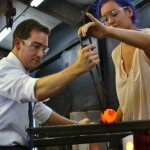 The SGS Instructor typically makes a vase or sculptural item in the studio. Tour and Demo attendees may buy the piece made at the end if they wish. 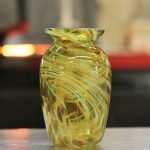 The Tour & Make-Your-Own Experience features the tour and a chance for your group to get in a studio and make a glass project alongside an experienced instructor. Pricing depends on the project your group makes and the number of participants. Each project is $45-85 and takes 15-30 minutes depending on the projects being made. There is a 10% discount for groups of 10 or more. 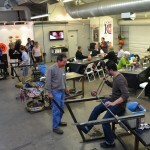 Sonoran Glass School welcomes you to have catered food and/or beer and wine during your event. We will coordinate with your vendor(s) and set up space and power supplies for food and beverages. 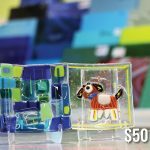 You can find more examples and details of the glass art projects on our Make Your Own Experience page. Pricing is reduced by 10% for groups of 10 or more. Call (520) 884-7814 to schedule today!